AVX Corporation has increased its TACmicrochip Series with what is claimed to be the lowest-profile 3216-footprint tantalum capacitor currently obtainable on the market. 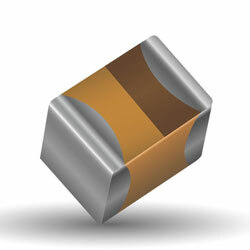 Measuring just 0.5mm high, the first new ‘I’ case capacitor (EIA Metric 3216-05) is rated for 10μF and 6.3V, but will be followed by later code releases to further increase the offering. The full line of these capacitors, which has also provided what is also claimed to be the industry’s lowest-profile 1206-06 tantalum capacitors since early in 2015, is currently offered in 11 case sizes with footprints spanning 1005 to 3528, heights ranging from 0.5-1.5mm, capacitance values spanning 0.10-150μF, and voltage ratings spanning 2-25V. Manufactured using a tantalum wafer process to deliver the high levels of mechanical tolerance demanded for ultra-miniature devices, these capacitors offer an enhanced internal construction that excludes the space-consuming elements of conventional moulded J-leaded tantalum capacitors, including the anode wire, lead frame, and the need for larger wall thicknesses. Rated for use in temperatures spanning -55C to +125C, the series is generally supplied with tin over nickel terminations, but gold over nickel options are offered as well.